Why Take the Stairs When You Can Take an Elevator? The current way of compiling data and generating investment reports is like walking up the stairs of a 100-storey skyscraper. With the software program “R (R Studio)”, it’s like taking a high-speed elevator/lift to the top. You walk into work with your cup of coffee at hand, you turn on your Bloomberg terminal (or whatever data service you use) and you start entering in Bloomberg codes (like TOP, WB, WEI, WF, BTMM, etc) for a summary of the market and your portfolios. This might take you some 10-20 minutes. You might remember a handful of codes you check on a regular basis but if you had to check for something new it takes you even longer to find the information you’re looking for. Or maybe you work in the back office and you’re responsible for compiling data and generating reports for the Investment & Fund Managers. It’s a grueling and tedious task. Just imagine if you had to deal with 10,000 data paths! You’re saying to yourself, “…there must be a better way to do this? …and that’s exactly what we show you with the Certified R-Specialist in Investment Analytics (CRSIA)™ training. Excellent trainer, knows his stuff and delivers the materials perfectly. …are ALL the reports (including sophisticated interactive graphs and charts) updated with the LATEST market data and portfolio (risk) analysis. …and all the work it took you was to write just ONE line of code (which we’ll show you how to do). …you just smile and knock out one to two lines of code and VOILA! 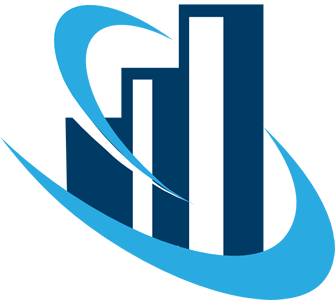 Advanced charts, graphs, data points with the ability to export into an interactive presentation AND set different parameters and conditions in a FRACTION of the time it would normally take. All in line with the dashboards you also have access to, built with the same toolset! Why spend large amounts of dollars for different software packages that can’t even be integrated into one if you can capture everything with one platform for free! You walk away from this training not just with a certification, but also a tangible R-Project that reduces a time-consuming task in your current job that you may implement and use immediately! And best of all? The software that helps you achieve all of this costs you (and your company)…NOTHING! Wait…Programming and Code? I’m no programmer! I know, just seeing the words “Programming” and “Coding”, you may be feeling a bit jittery. But don’t worry, because this training is built for anyone …even without any coding experience or knowledge to become adept at using the R software. And because so many people will see this and run the other way, it means if you have these skills, you are going to be in HIGH demand. Unlike any other Investment Analyst, you’ll have a certificate AND badge to prove your Investment Analytics expertise from a source that is trusted by global businesses – which is what REALLY counts. More importantly, it will make you a better Investment & Analytics Professional. You will be asked to bring along a relevant time-consuming task you currently face in your job – this is the basis of your certification assessment. You will create a new R-project from scratch that reduces the time used for this task so you also walk away with a tangible, usable project that may be implemented immediately. *If your certification project involves confidential/sensitive data/information, non-disclosure agreements may be made with the Instructor. You are not required to share any of this confidential/sensitive data with others. The instructor will only evaluate the end product and not the data sources (unless given permission). *** No prior experience in coding or R is required. What else do you get from this workshop? This is a hands-on / full immersion training that gives you a solid foundation in all aspects of investment analytics with the open source software R, one of the fastest growing open source communities worldwide. Due to the highly practical and hands-on nature of this course, we’ve limited the intake to just TWELVE people. Data Visualization since it is a key component of everyday analytics, including dynamic charts. You are getting a 2 for 1 course where you learn coding from the ground up AND learn the advanced Investments Analytics skillset. 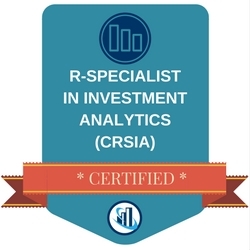 This digital badge designates you as a Certified R-Specialist in Investment Analytics (CRSIA)™, which you may use on business cards, resumes, LinkedIn profiles, website profiles, email signatures and more. In addition to the Certificate of Completion for the course in general, if you successfully pass the Certification exam, you also receive a CRSIA™ Certificate to mark your achievement. As part of your successful certification, you also receive a full year's access to the Data Science & Analytics Membership to help you keep up-to-date on the industry issues. …the live course is limited to only 12 seats and we send out an announcement of this course to our internal list of 97,439 contacts in our database (this doesn’t even include new contacts we add to our list through external advertising & promotions too).